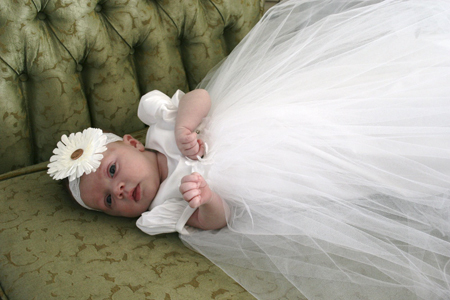 Our Chloe christening gown for girls features everything you want for your little princess’ once-in-a-lifetime dress: luxurious materials, classic styling, and attention to detail. 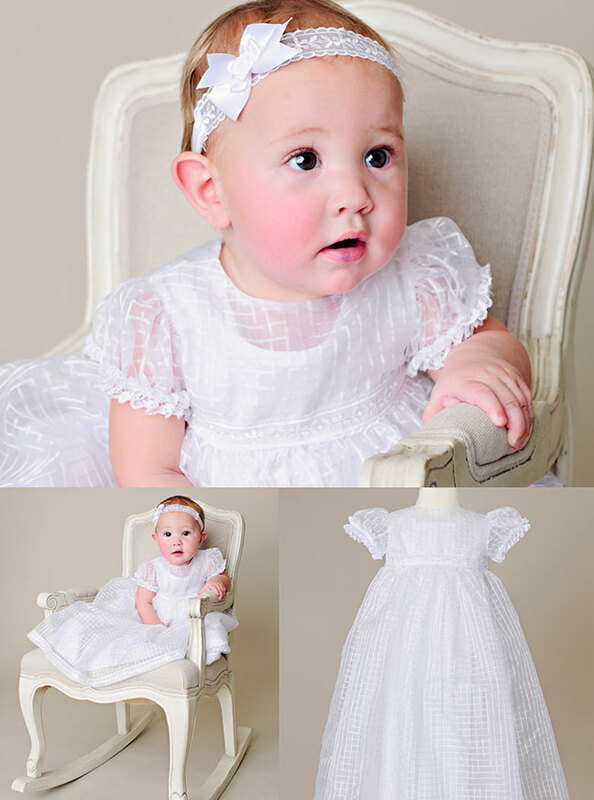 In a soft shade of ivory, so very close to off-white, the floral pattern of the netting lace on this lovely christening gown is richly embroidered with a scalloped edge lying a couple inches above the finished hem of the pure silk underskirt. Miniature pearls are scattered over the embroidered lace trim that adorns the bodice, sleeves, and bonnet of the gown. 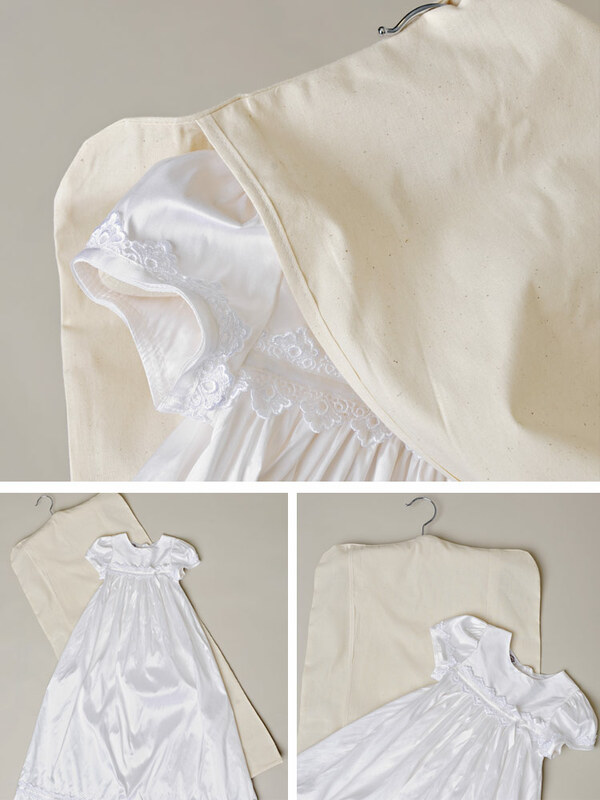 The main body of the baptism dress is constructed of pure silk dupioni, a lovely mid-weight fabric that holds it’s shape and glows with a delicate sheen. A beautifully ruffled slip of 100% cotton is included for comfort, coverage and added body. Chloe’s sweet high-waisted bodice and gently puffed sleeves feature embroidered lace with a light scattering of tiny pearls. A pure silk ribbon bow cascades from the waist. 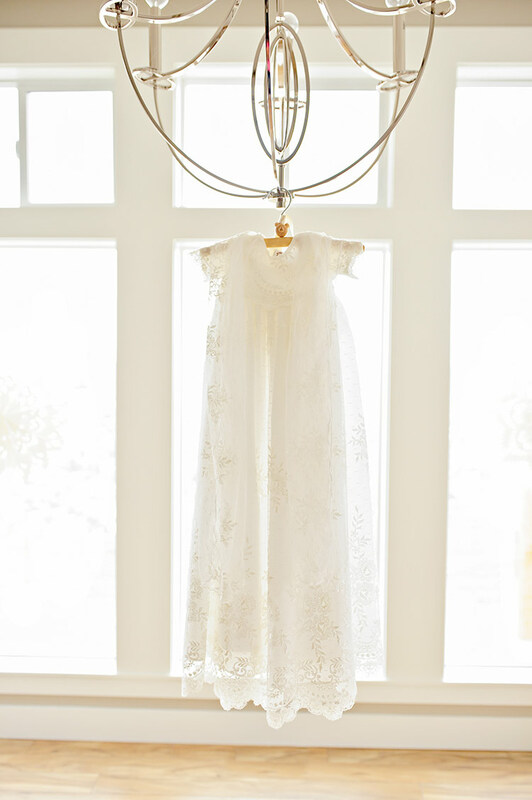 The scalloped hem of the rich lace overskirt is set off by the simple silk hem peeking beneath. 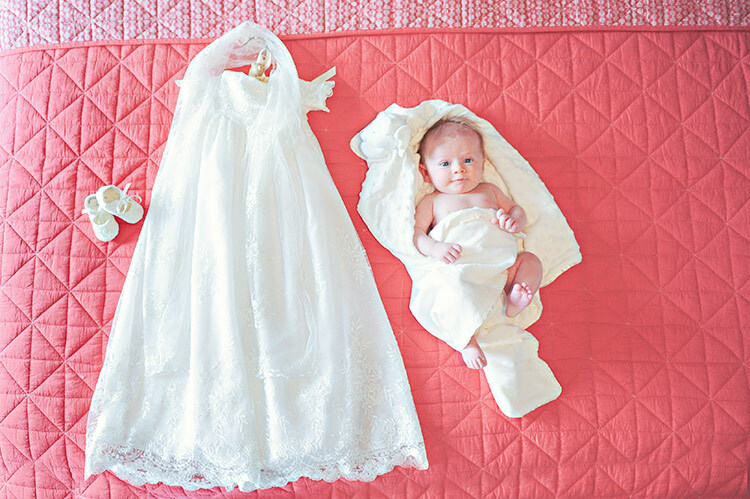 The overall length of the gown falls several inches past Baby’s feet for a dramatic effect, measuring approximately 28-29″ from shoulder to hem. 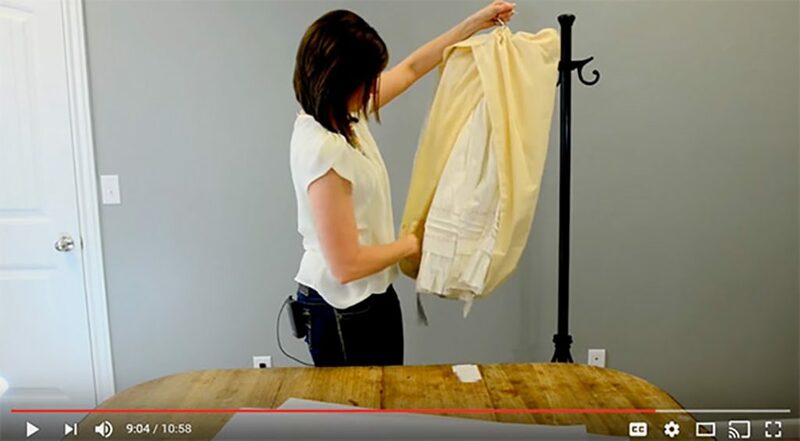 The full skirt sweeps to a generous 60″. 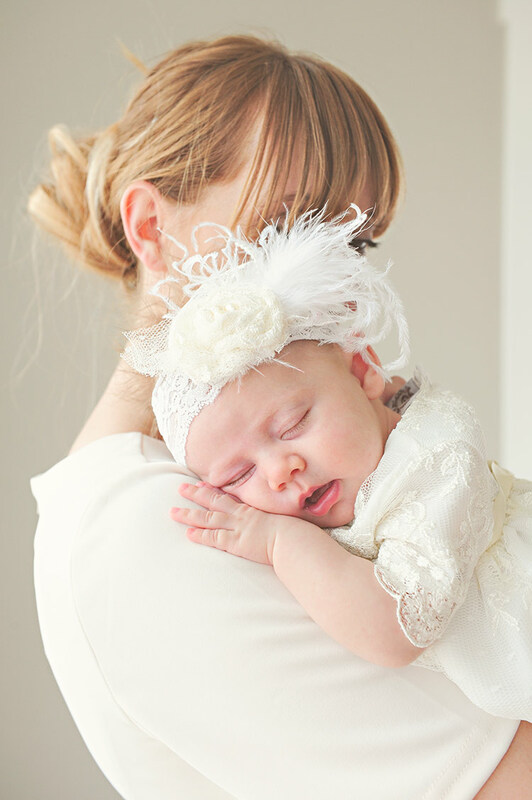 A traditional bonnet is included, with sweet gathers around Baby’s face, more of the pearl-encrusted lace trim, pure silk ribbon ties, and a keyhole back. 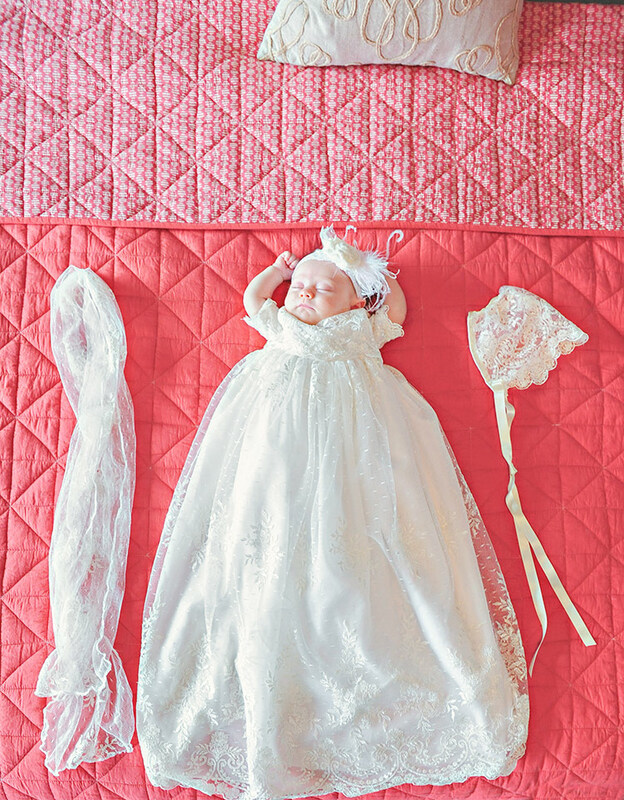 The little sister to our stunning Sophi gown, Chloe coordinates perfectly with the Sophi accessories; each features the silk, laces, and trims utilized on the gown: a show-stopping lace and ostrich headband, a gorgeous yet practical bib, dainty floral slippers, and a richly ruffled blanket. Any or all will add an air of luxury to her very special day. 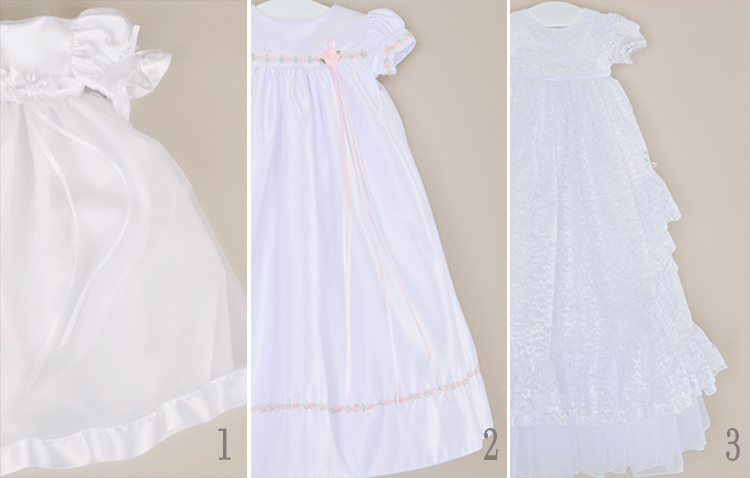 “Last summer I ordered a blessing gown, your Clarice gown, for my daughter Lily. 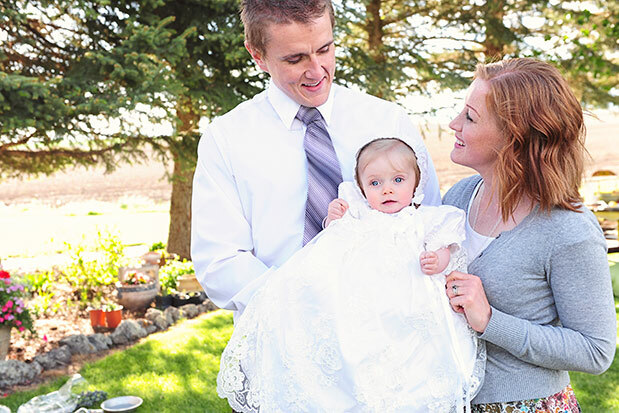 I spent several weeks looking for the perfect gown for her blessing day because this is a once in a lifetime experience and a very special day for our family! This is our first child, and I wanted a perfect dress for her. Ordinarily, I do not worry about things like this. In fact, it took me about five minutes to pick my own wedding dress! However, having a baby changed my life, and I love taking my time to make sure Lily has the best. I finally decided on your Clarice gown. I shopped online at many places, but the decision did not get difficult until I narrowed it down between two at YOUR shop. I finally had to take a vote, and we decided on the Clarice. Why does the above confession matter? The holidays are fast approaching, and I decided that for Christmas this year I would like to create small photo books for each of my three kiddos chronicling the first year of their lives (because I’ve also been a bad scrapbook mom). I started sifting through digital files and quickly pulled together sweet little books for my younger two, then realized I didn’t have much on file of my darling first-born. How does this happen? Well, the short answer is: the digital camera we had when she was little is so archaic the files had to be specially converted, and somehow over the years, we’ve lost a lot of images. (Back to that printing problem I’ve already explained.) Boo. This morning Grammie came to the rescue! 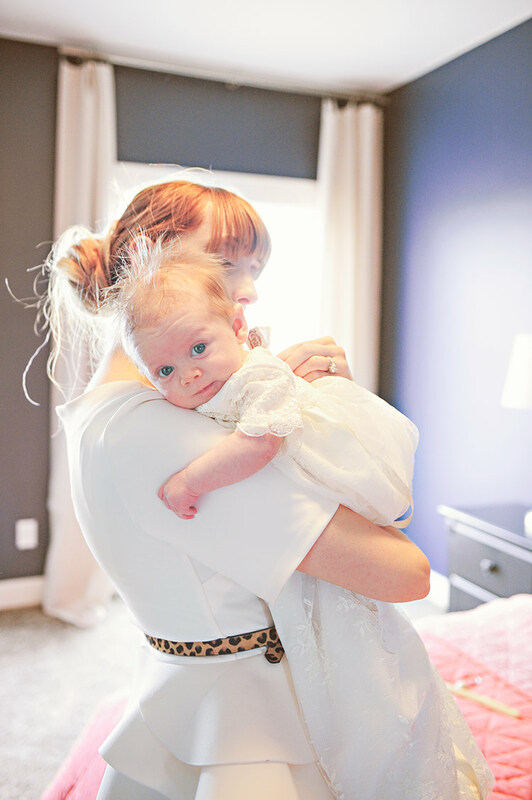 She dropped by with an external drive filled with portrait sessions of my babies, sessions I had completely forgotten. 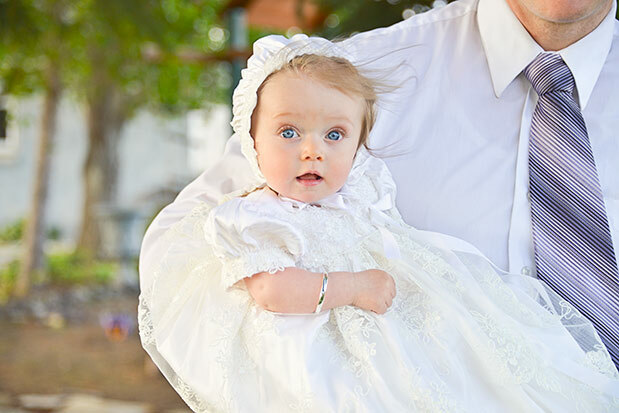 One of those sessions included this image of my sweet little one in her original version of our Jessa blessing dress. Phew! So this whole episode got me to thinking: do you have similar experiences? Do you find that some things you’d like to do fall by the wayside in the crush of busy-ness and responsibility that is the life of a mother or grandmother today? I’d love to know what those things are…and that I’m not alone in not having *everything* as together as I’d like. Just for fun: all those who join in conversation in the comments section of this post before 10 p.m. (Mountain Time) Wednesday, September 15th will be entered in a random drawing for a $25 gift certificate to One Small Child. One entry per person, but feel free to converse away! 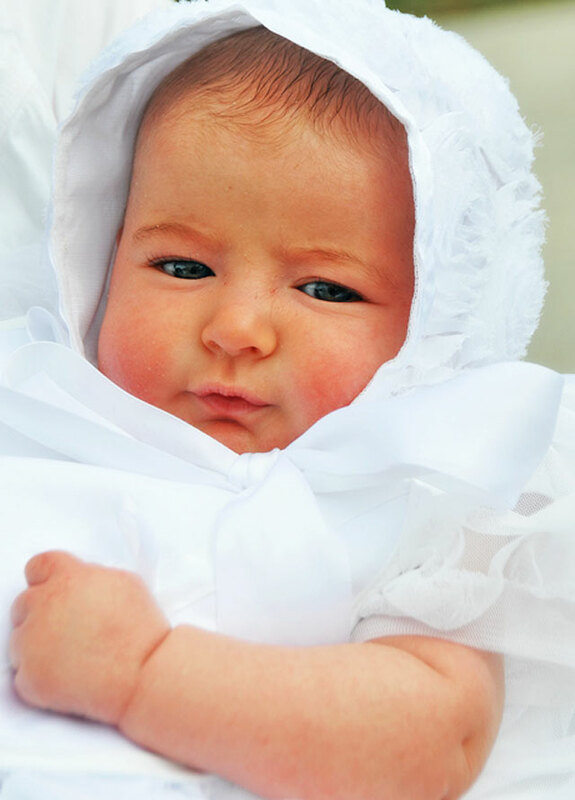 Choosing an outfit for baby’s christening or blessing is different for everyone. Sometimes, you know the perfect gown or outfit when you see it and there are no questions. Then again, there are times you have so many options you just don’t know which way to turn! We understand that it can be difficult to make such a big decision based on two-dimensional pictures…it’s important to be able to see and touch and compare in person. 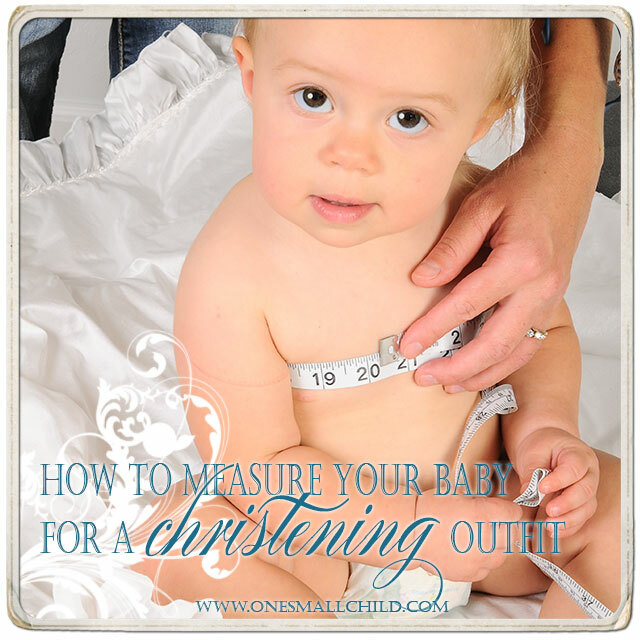 With that in mind, we gladly offer the option to purchase up to three styles (or sizes…if that baby is in-between) to review at your convenience. After you receive your order, make your choice in the comfort of your home. When you’ve made your decision, simply return the unwanted items within 15 days of their arrival in your home. No need to expedite return shipping, just have them in the shipper’s hands within the 15 days. We recommend you use a trackable shipping service, so delivery can be verified. Your card will be refunded when we recieve your return (please note: return transactions can take 7-10 days to appear on your bankcard statement).